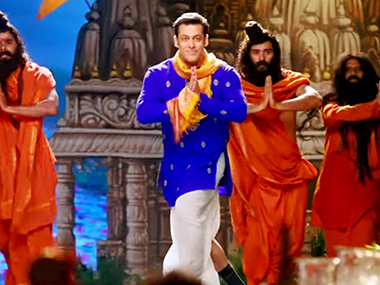 In Prem Ratan Dhan Payo, the family celebratory song marks Salman Khan's arrival in the film. Now from Hud Hud Dabang to Selfie Le le re, we all know Salman always has an entry song in his more recent films. So when you fuse the two together, you get Prem Leela: Salman's introductory song in Prem Ratan Dhan Payo and the family celebration song as well. It's only the cherry on the cake that the song has been picturised during Ram Leela celebrations as well. In Prem Leela, there's an overt display of love towards family, snippets of Sonam Kapoor, Sanjay Mishra and other actors in the film, but predominantly Salman Khan in every frame. The song itself could be any Salman Khan song. It has the characteristic dance beat, some whistles thrown in here and there, and Bhai's famously incoherent choreography. All in all, Prem Leela is mad fun (if you don't take it too seriously). Prem Ratan Dhan Payo will release on 12 November.